The winter holiday season has ended. Fir trees everywhere are meeting their wood-chippers, and folks like me have drained all the nog and gobbled up all the figgy pudding. ‘Tis the season now for short-lived resolutions: namely, burn off all the nog and pudding that stuck to our butts like staticky tinsel. The new year truly asks us to contemplate our futures, to think about becoming more complete people. At their core, new year’s resolutions are all about this quest-for-improvement. We want to make our futures better than our pasts and grow as individuals and communities. And what better time to do so than the arbitrary flipping of the calendar’s odometer to a new set of numbers? To lend credence to this sociological theory, which I certainly did not just make up, I point to the indisputable historical fact that our modern New Year’s Day might be possibly tied to the winter solstice, maybe. The winter solstice marks the shortest day of the year. Ancient civilizations, such as the Chacoans, the Greeks, the Chinese, and hippies, all recognized the importance of this day to the annual cycle. By that time, all food has been harvested that’s going to be, and every plant that can’t survive the winter has died or dropped its leaves. The solstice was the time of death. But the solstice also blocked out the schedule for revelry, drunken abandon, and mischief. For the rest of the friggin’ year, everybody had to be, like, responsible and stuff, or else come winter they’d die, too. So why not take the time off and let their inner fools out to play? Of course, every mess has a mother telling someone to clean it up. And so it was that the ancient peoples’ mothers made them clean up after their solstice shenanigans and promise to be good boys and girls the rest of the year. So they resolved to grow more squash, or not to kill their neighbors’ cattle when they lowed all night long, or to build better hunting traps, or not to covet their friend’s bootleg collection of Byrds concerts. They didn’t arbitrarily assign these resolutions to January first. They incorporated their commitments into the cycle of the sun in the sky and the crops in the ground and the festival concerts in California. Failing to do (or not do) these tasks had real-world repercussions much more primal than not going to spin class. They made these resolutions because their lives depended on it. They could literally die if they didn’t figure out ways to live stronger, more complete lives. I, for one, allow my resolutions to fall off the treadmill every year before Martin Luther King, Jr. Day. In fact, I ceased making resolutions about the time we stopped capitalizing the word “internet.” Perhaps my resolutions failed because there’s nothing more to back them up than a fresh set of digits, which I’ll write incorrectly on checks for half the year anyway. If I tied my resolutions to tangible, real-world phenomena, maybe they would survive longer than grocery store poinsettias. Unfortunately for me, I now have that real-world reason. I’m sticking to whatever resolutions I can come up with this year. I’m too terrified not to, because I’ve discovered the Krampus! Whatever kind of wrath it divvies out like arsenic candy canes, this anti-Santee Claus embodies everything that mall Santas wish they could do with impunity to lap-wetting children. To which I would answer that Krampus is older than all three Wise Men put together. It’s even older than AMERICA! To a being that old, all of us mortals look like a bunch of kids. I agree with you, hypothetical reader, that the only humane use of drone missiles is to obliterate any radio station or store that plays holiday tunes before Halloween. 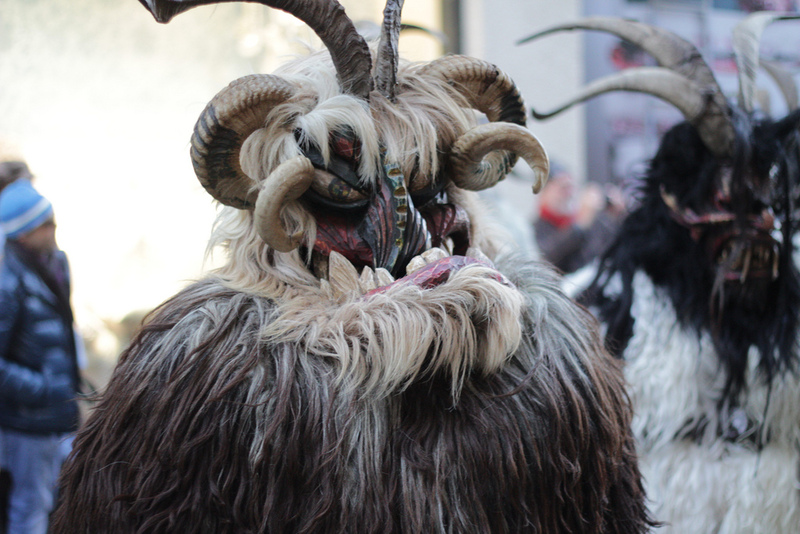 However, as much as I wish you were right about Krampus being made-up fun, you’re wrong. To which I say: “Ouch.” But, your awful pun aside, Krampus is no mere seasonal bugaboo. Santa Claus might put the naughty-or-nice list on autopilot until December, but the Krampus never takes a vacay. It watches at all times; it’s the do-or-die factor to living a better life (or living at all); and staving it off is the reason I’ll be a good boy who respects his resolutions. I’ll make them meaningful resolutions, too—none of those cop-out obligations like “I resolve to eat more pizza.” I’m talking a full-on, feed-the-world and love-thy-neighbor level of commitment. If I can make these resolutions last as long as a Christmas fruitcake, I should manage to dodge an eternity of reality television for one more year.